Greetings, comrades. I’d like to share some thoughts and observations on the issue of White character, and how it (or the lack of it) impacts the whole spectrum of what could be called White Nationalism, and, more importantly, how the character issue is perceived by “mainstream” Whites; that is to say, those individuals who do not openly identify with us, but share many of the same values and have come to the same conclusions about the world we live in. Obviously, this excludes the Marxist loonies and various “antifa” groups, whiggers, etc., who pretty much have to be written off, unless they can do a full 180 degree turnaround. Possible with some, however unlikely. The enemy and their media stooges have done a great job in portraying any White man or woman who openly advocates for their racial interests as “haters” and “fascists.” This is obviously untrue, but we must face the fact that, for the last fifty years or so, many of the so-called “spokesmen” for our movement have practically handed the enemy the ammunition that he has pummeled us with. Don’t get me wrong; if the system wants to discredit someone, by the manipulation of electronic media they can make Mother Theresa look like a raving lunatic, but all too often, with our own movement leaders, all they had to do was turn on the camera, and watch as Dr. Jekyll turned into Mr. Hyde. There is really no point, with the current regime in control, to attempt to break through this wall of lies that is the media. We will never get a fair hearing, no matter how we present ourselves. This is why I feel that it is so important that our primary contacts be face to face, and that is where the issue of character comes to the fore. I believe there are two primary reasons for poor character: intrinsic and extrinsic, or, if you like, nature and environment. There are, unfortunately, some individuals who are constitutionally incapable of exercising self-control. In the past, in saner, more Tradition based societies, these individuals learned to work and obey. In today’s anarchic society, they are free to run amok. What is prevalent among our folk, however, is the latter: environment. An environment that rewards dysfunction and celebrates mediocrity. In a word: America. Perhaps Francis Parker Yockey said it best when he remarked that liberalism is synonymous with weakness; it wants every day to be a birthday party. This attitude has been, to a greater or lesser degree, prevalent with every generation since circa 1945. Americans have come to expect their lives to be attractively packaged with a money-back guarantee, and the option to return any unpleasantness or hardship, no questions asked. I suspect that part of the apathy that White Americans have shown in recent years, and the seeming inability of our folk to act against this system that is slowly destroying them, is the disconnect many feel at an almost unconscious level with the expectations they were raised with, and the reality of their lives today. The American sense of entitlement is a character flaw on a nationwide scale. Along with the sense of entitlement comes the idea of “something for nothing.” Grifters and scam artists have made a killing in America just working this concept. As a kid growing up, and in my early years in the workforce, I wish I had a nickel for every time someone said to me, “Hey, don’t work hard, work smart.” Translation: slack as much as possible and still get paid. Back to Yockey’s quote: every day is a birthday party. I probably don’t need to list much more; after all, you’re observant and you live here, too. The overblown consumption and excess, the lack of civility and anything approaching respect, the random violence, etc. All point to a nation, indeed, a civilization, in radical decline. What to do? Here, as in other areas, I believe that a look back to the past and the ways of our ancestors are what’s called for. Certainly, our own times are placed in a unique historical context, so I do not advocate trying to copy what they have done. We need to look back over the long haul and see the values that have prevailed among our own folk, and see if we can then use their example as a kind of template that we can use. What jumps out at us as we look back in time? What strikes me is our ancestor’s sense of self-reliance. One of the qualities that I think could define the White race in the past was this aspect of ourselves. The traditions of the yeoman farmer of the era of Jefferson to the great pioneer migrations Westward, our people have always prided themselves on the freedom that comes with being able to do many things, and do them well. Early settlers had to be carpenters, farmers, and blacksmiths all rolled into one, while White homeowners today can’t even manage to cut their own grass. There was actually a time in America when having to work for someone else was considered repugnant. It is time for a rebirth of that kind of spirit. Money and ease was not always the measure of a successful life. Certainly, our ancestors considered these to be important, but other things occupied a higher place. Family, religion, and community played a large role in their lives. One of the most disgusting aspects of life in America today is the idea of the “loser,” the guy who has never quite “made it,” according to the standards of America. This is a real impoverishment of spirit. Those of us able to incorporate these positive traits will never fail to impress our folk, particularly in a one-on-one conversation. People always respond well to someone who shows not only confidence but also courage; in a sense, it gives them “permission” to feel the same way. There are far too many naysayers in our movement; the types that always bemoan the latest black on white crime statistics, the imploding economy, and how it’s all so useless because the “system” is just too strong to make any meaningful changes. Quite the opposite is true. America is a bankrupt bureaucracy, and over the last fifty years or so, this nation has been hollowed out from within. Too many parasites, and the host finally dies. Many of us alive today will finally see the end of America as we know it. Now is the time to show our folk the alternative to the American Dream, which is only the dream of the well fed pig in the sty. How can we be the type of people that our ancestors would not only recognize, but approve of? After all, we are the living embodiment of them. It’s not like they are some vanished race that we could never emulate, like Tolkien’s elves. They are us, and we are them. Sometimes it helps to keep a historical perspective. The liberal rot has been with us for a few hundred years, but what is that compared to the previous 40,000 years, when our character was forged in the ice and snow of the North, and determined men set sail in open boats to uncharted lands? The highest tribute we could pay to those who have gone before us is to consciously emulate the virtues that sustained them, and will ultimately sustain us. How do we begin this process? One step at a time. We don’t have to tackle everything at once. If we are dealing with personal bad habits, like excessive drinking or smoking, it is a question of will. Changes in character are harder, because on one level you’re fighting yourself. I’m referring to ingrained behavioral responses like excessive anger, habitual lying, etc. To begin to change, we first need to identify the problem. All too often, these are so ingrained that they are unconscious. Don’t be afraid to face yourself. Many individuals put this off until a crisis (physical or spiritual) forces them to confront it. The first step in any path of spiritual development is the Hermetic axiom ‘Know Thyself.‘ Begin a program of meditation and keep at it. Honor the gods and goddesses regularly. If you want a guide for ethics, nothing beats the philosophy of Marcus Aurelius. Stay strong, stay confident, and stay sane. As I stated earlier, people will respond to someone they respect and who is a potential leader. The correct path of conduct is often the harder road, but when people see that you won’t back down on your principles, and that your word is your bond, you stand as a shining example that will inspire others. The Left loves to paint us as always being against everything; that we live in the negative. Let’s not be afraid to show them that we stand for everything that is honorable and transcendent in this world: order, hierarchy, and inequality, because in a world with these values, everyone has a place, and people are not just interchangeable units of production and consumption. We stand for folk and family, and we stand proudly for race. These are timeless values, and we have the unique opportunity to show our own folk a radical vision of a new world, but only if we can embody it ourselves. Greetings, comrades. In this essay I would like to address the topic of myth, its place in the life of the Folk, and how it will be necessary to resurrect the mythical in order for us to be victorious in the gravest crisis we have ever faced as a people: our possible extinction. Myth, in my view, is intrinsically bound to a religious conception of the world. Myths are the shared stories of a particular people that deals with the major existential questions that define what it means to be human: the origins of the Folk, their place in the cosmos, etc. In this area, we are no longer dealing with facts and the purely rational, we are dealing with the emotive power of imagination and Spirit in a racial context. Herein lies the power of myth. Myth in a racial context supports and reinforces a particular people’s quite natural feelings of racial pride, solidarity, and superiority. The Indo-European ideal of the leaders of the people as being favored by the Gods has its corollary in the Chinese ideal of the “Sons of Heaven.” A people’s racial and cultural identity is forged and sustained through its heroic myths. The threats, sometimes on a cosmic level, that a race faces, and how that threat is usually thwarted by a hero, helps to define not only racial identity but also pride. It is vital for White men and women of European descent that we are once again filled with a sense of purpose; indeed, with the sense of a transcendent mission that myths afford us. Without this, I fear that we will continue to fight a losing battle. The liberal left, of course, denigrates myth. I should rephrase that and say the liberal left denigrates the myths of the European peoples, while professing to love and admire the myths of other nonwhite races. This attitude, I believe, has its origins in Rousseau’s idea of the “Noble Savage” so popular during the Enlightenment. For those not familiar with this concept, Rousseau had formulated that man’s base nature was a result of his having developed civilization (!) which supposedly cut him off from the primordial innocence of the nonwhite savage, who lived in a state of nature, unencumbered by greed and the acquisition of wealth and material goods. This proto-communist theory, thoroughly discredited by observation if nothing else, refuses to die, and in one form or another continues to inform the worldview of the left. Here is an example of the power of a negative myth. Heroic myth stands as a refutation of the liberal/left worldview that we all “make it up as we go along;” that there is no such thing as prior essential truth. One of the recurring themes of European myth is that of sacrifice. A god or demigod (hero) sacrifices something in order to gain something for his people. We see this motif in the Finnish saga of the Kalevala, and also in Norse mythology in the sacrifice of Odin, who hangs for nine days on the World Tree to learn the eternal truth of the Runes, which is then gifted to mankind. Our myths celebrate the hero who boldly faces evil in the name of his people, and brings to them freedom and knowledge, or rights a particular wrong, thereby restoring the balance so the nation can once again prosper. The Grail saga would be an example of this. The modern world, having been leached of almost all forms of Spirit and the heroic ideal, is ripe once again for the mythological. One only needs to look at the phenomenal success of J.R.R. Tolkien’s Lord Of The Rings, both films and books, to see that this is true. 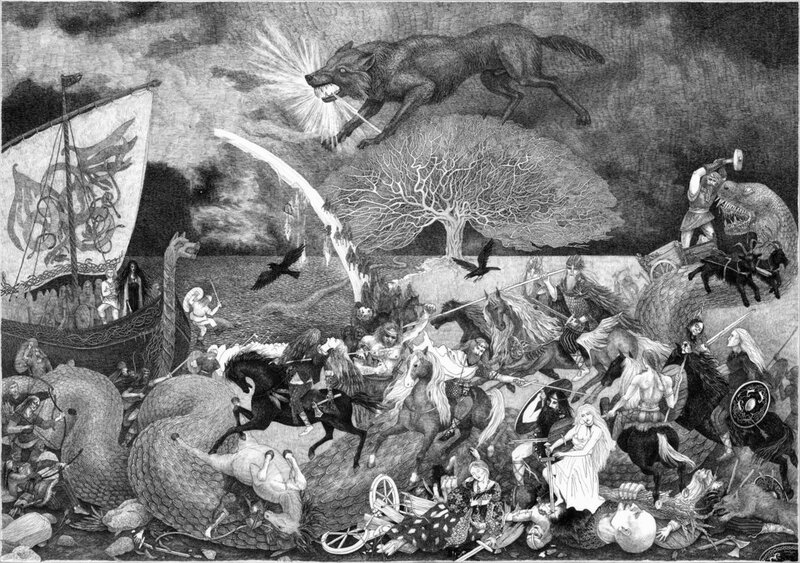 Tolkien himself said that he had written the trilogy as a mythos for the Anglo-Saxon peoples of Britain, who he felt had been robbed of their own myths as their oral culture was lost in the aftermath of the Norman conquest. Since the end of the Second World War, it is the White race, and the White race only, that has been forced by its legions of culture distorters to dwell only on its times of despair. No other race or people focus on the negative parts of their own history to the exclusion of everything else. White men and women built a civilization that has not been equalled by any race in this Age, and we will no longer apologize for it. A reawakening of the mythic is the perfect antidote to this poison. It has been said that the definition of the hero is the one who stands against the many, and the definition of the coward are the many who stand against the one. Many enemies are arrayed against us today, but if our history and myths can teach us anything, it is that free White men and women, infused with an ideal, and led by men who deserve the title of leader, can accomplish great deeds. I will remain stubbornly optimistic, in spite of the defeats we have suffered in recent history. They are temporary setbacks, for we stand on the side of a spiritual worldview that expresses itself in order, hierarchy, and the dharma of natural law. We envision, and we will see, a world in harmony and balance, with a place for everyone, and everyone in their place. The World Controllers stand for money and slavery. We shall keep up the struggle for our lives, our freedom, and our race, for we should never doubt that the truth is with us. Let us keep fighting the good fight, and soon we shall see the Once and Future King again step forward from our ranks. Myth shall once again become reality. This entry was posted in Uncategorized on 07/12/2015 by Völkisch Pagan.